The Flecktones reemerged last year with a new album "Rocket Science", on a new label, (eOne records) and announcing that for "the first time since 1991, pianist/ harmonica player Howard Levy has returned to the fold alongside bassist Victor Wooten, percussionist/Drumitarist Roy “Futureman” Wooten and banjoist bandleader Fleck to create some of the most forward-thinking music of their long, storied career. While all manners of genres come into play – from classical and jazz to bluegrass and African music to electric blues and Eastern European folk dances – the result is an impossible to pigeonhole sound all their own, a meeting of musical minds that remains, as ever, utterly indescribable. Simply put, it is The Flecktones, the music made only when these four individuals come together." Next Thursday night, the Flecktones return to the Regency Ballroom alongside violinist Casey Driessen. Longtime followers of Fleck recall that he took up the banjo at an early age, growing up in Manhattan of all places, eventually migrating to Nashville. Once there, he aligned himself with the now legendary "New Grass Revival", with Mark O'Connor and Edgar Meyer. Desiring to combine bluegrass with jazz, rock, and world music, Fleck began seeking other like minded folks to give life to those ideas. Not long after that, he teamed with virtuoso harmonica player Howard Levy, one of the world's greatest electric bassists Victor Lemonte Wooten, and his eccentric brother, percussionist Roy "Futureman" Wooten. "Futureman", had apparently taken a $10,000 "Synthaxe" guitar synthesizer, cannibalized it, and turned it into an electronic "drumitar", half guitar, half drum machine. The result was spectacular, as they created a sound unlike anything heard before them. After years of touring the globe, and several successful albums, a road weary Levy left the group and was eventually replaced by saxophonist Jeff Coffin. Since then, the Flecktones have performed with an incredible array of musicians; Phish, Dave Matthews, Chick Corea, Branford Marsalis, a Tuvan throat singer named Ondar, Indian tabla master Zakir Hussain, reed master Paul McCandless, steel drummer Andy Narell, Jean-Luc Ponty, Chick Corea, Stanley Clarke others. With the departure of Jeff Coffin to the Dave Mathews Band, The Flecktones regrouped and with the return of Levy, produced one of their best albums in years. I particularly enjoyed the delightfully complex "Life in Eleven" and the grooving, vintage-Flecktone sounding "Gravity Lane". 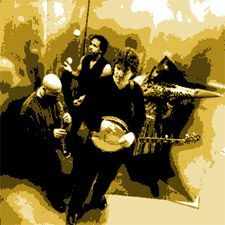 Over the years the members of the Flecktones have enjoyed the benefits of recording and touring with many of the musical greats.I could clearly hear the influence that virtuosos Corea and Clarke had on both Fleck and Victor Wooten. Wooten spent time on the road with Corea and later with Clarke and bassist Marcus Miller in SVT. Fleck's tour with Clark and Ponty was amazing, as was his duets with Corea. Fleck's composition "Storm Warning" was written for the Ponty-Clarke-Fleck group, "Trio". While all manner of genres come into play from classical and jazz to bluegrass and African music to electric blues and Eastern European folk dances the result is an impossible to pigeonhole sound all their own, a meeting of musical minds that remains, as ever, utterly indescribable. Simply put, it is The Flecktones, the music made only when these four individuals come together. "I didn t want to just get together to play the old music", Fleck says. "That s not what the Flecktones are about. Everybody s full of life and ideas and creativity. I was intrigued by what we could do that we had never done before." It was also great to hear Howard Levy back together with the Flecktones. The warmth of his harmonica playing and his uncanny ability to play it simultaneously with piano is simply amazing. Levy also contributed some new compositions to the album ; The aforementioned, quick little 11/8 piece "Life in Eleven", "Joyful Spring" and the intriguing "Sweet Pomegranates". Futureman continues his foray into the world of innovative acoustic and electronic percussion with a solo piece entitled "The Secret Drawer". There is quite a bit more acoustic drumming from Wooten on this album, and his library of deftly played samples never seems to end. One of the best parts of the Flecktones has been having the Wooten brothers for a rhythm section, a tandem Fleck himself has called "dangerous". Spinner's Tad Hendrickson upon reviewing this album wrote, "Originally, the Flecktones' studio albums were made up of stuff that had been worked over on tour, but this time around the band had to write, rehearse and record without playing it live. "Although nothing replaces refining a song on tour in front of an audience, the old hands have a pretty good handle on the material and it came together fairly quickly", according to Fleck, meaning that "there is a freshness to the material that might not have happened otherwise." "Although on par with the three classics with Levy, 'Rocket Science' has a more collaborative approach than the band's initial releases. Fleck had distinct ideas and objectives for the band in the early days, which meant that the band wasn't always open to what Levy brought in, writes Henrickson. "Whereas the earlier version of the band was more about a focused sound, this time around the band is looking to broaden its approach and try new things..."
Rocket Science is indeed a snapshot of the musical journeys taken by the four original Flecktones, a melding of those experiences in songs and culminating in a sound that is undeniably theirs. The wonderful chemistry that existed among that quartet back in '89 is still evident today, making Rocket Science perhaps the Flecktones best effort to date.